WHAT is Wine Co Club? Your wine life is about to get better. Wine Co Club is your access point to an amazing world of wine. Access to a world of wine education and information. Access to winemaker seminars and member-only events. Access to a community of like-minded wine enthusiasts. available to you through your favorite retailer of choice. By joining Wine Co Club, your wine life will never be the same again. 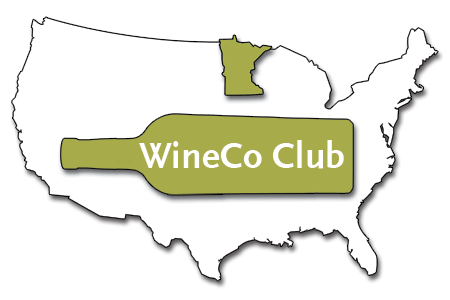 Wine Co Club is run by The Wine Company, a fine wine importer based in Minnesota, USA. Since 1985 we have been travelling the globe searching for incredible wines from small family run estates. This has resulted an amazing portfolio of gems, many of which are unavailable anywhere else in the United States. Our speciality lies in the wines of France, but we have exclusive import arrangements with wineries around the globe, including Italy, Spain, Australia, Austria, New Zealand, Germany. Additionally, we represent phenomenal properties from California, Oregon, and Washington. Ready? Joining is as simple as can be. Traveling the world to find the finest wines from family owned estates since 1985. THEY SPIT SO YOU DON’T HAVE TO. but it’s even better for residents of Minnesota. All members of Wine Co Club will receive emails guaranteed to enhance your wine knowledge and enjoyment. We assure you we will never be spammy or boring. You will also be offered opportunities to reserve amazing wines that are nearly impossible to find in the United States. Minnesota residents will additionally receive information on wine dinners, winemaker seminars, events, and tastings happening throughout the state. Offerings of wine rarities, available through your retailer of choice. Many of these wines are difficult to find, and are often not easily available elsewhere in the country. Our wines are shipped directly from Europe in temperature controlled containers and stored in our climate controlled warehouse in Saint Paul, Minnesota. Educational communication that will enhance your wine appreciation. Opportunities to attend seminars, wine dinners, and events not open to the general public. Exclusive tastings throughout the state of Minnesota, only available to Wine Co Club members. and start the next chapter in your wine life!